Drug dealer Neil Reilly, who was beaten and hacked with a machete before being fatally run over, was killed after his gun attack on a rival’s house backfired, gardaí suspect. The dead man had a number of convictions for drug dealing and other offences – including burglary, in his native Dublin, as well as Meath and Cork. He had spent time in prison, his longest sentence a seven-year term with one year suspended imposed in March 2011 for possessing drugs for sale. The 36-year-old father is believed to have been involved in a shotgun attack on a house in Ronanstown, west Dublin, just before 4am on Wednesday. The livingroom window of the house was blown in by one of the shotgun blasts. Some of the occupants were watching television at the time, but they were not injured. While Reilly, and possibly an accomplice, sped away from the scene in a silver Mazda, four men went in pursuit in two other vehicles. 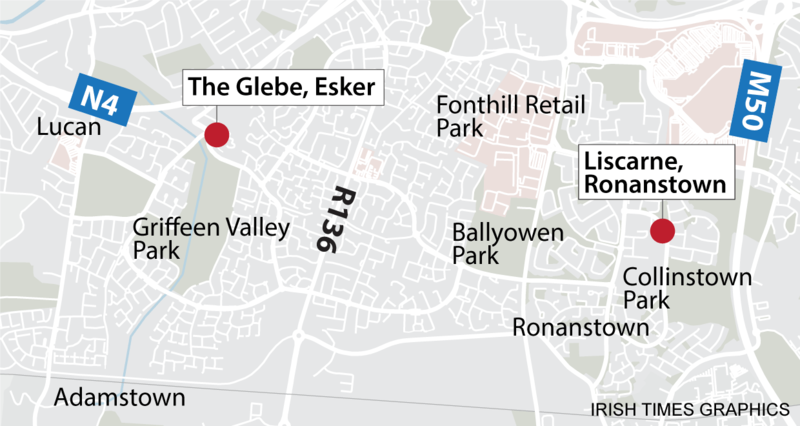 The chase took the three cars from the scene of the shooting at Liscarne Gardens, Ronanstown, to The Glebe, Esker, Lucan, about 5km away. Gardaí believe the car Reilly was in hit a signpost at The Glebe, a residential area, and spun across the road before coming to a stop. The Mazda was then hit by at least one of the pursuing cars. It was unclear whether Reilly was then pulled from the car by his attackers, or whether he got out of the Mazda of his own volition in an effort to escape. A fight ensued on the street during which the men who had pursued Reilly produced knives and a machete. Reilly, who had at least one child, was beaten and also suffered wounds consistent with being stabbed or slashed. As he lay badly injured on the road, one of the cars carrying some of his attackers was driven over him. Local people, who had heard the sound of the vehicles crashing at about 3.40am on the street outside their houses, saw some of the violence unfold. When the men who attacked Reilly escaped in their cars, locals rang the emergency services. Gardaí were also quickly on the scene, with the high-speed chase having passed a patrol car on the opposite side of the road just minutes earlier. Reilly, who lived at St Finian’s Close, Lucan, about 500 metres from where he was attacked, was treated by paramedics at the scene. He was taken to Connolly Hospital, Blanchardstown, but died from his injuries about an hour later. Supt Dermot Mann said he and his colleagues were still trying to establish how many men were involved in the attack, but some witnesses reported seeing at least five or six people on the roadway at the Glebe. He urged any local people from The Glebe or Liscarne Gardens to come forward and speak to the investigation team in confidence. Gardaí also want to speak to anyone who may have witnessed the high-speed chase in the early hours from Ronanstown to the Lucan area. While the dead man was pursued and attacked by a group of men who believed he was responsible for shooting at the house in Ronanstown earlier, gardaí are still trying to establish a motive for the shooting. However, detectives believe it is linked to Reilly’s criminal background and specifically that it was drugs related. The scene of Reilly’s beating and stabbing in Lucan was sealed off through yesterday. The car he was in remained at the scene for much of the day and the damage to it following the collision was obvious. A pool of blood also marked the spot where he lay bleeding and the large area of road and footpath was examined by members of the Garda Technical Bureau. The street outside the house in Ronanstown was also sealed off and examined. The broken window and two spent shotgun cartridges on the pavement outside the terraced local authority house were visible to passersby.